The Low-Down: Huawei Surpasses Apple To Become Second Biggest Smartphone Seller. Does It Matter? Huawei Surpasses Apple To Become Second Biggest Smartphone Seller. Does It Matter? Huawei is selling inexpensive devices to the mass market whereas Apple has chosen to focus on an upscale customer who offers greater profitability. 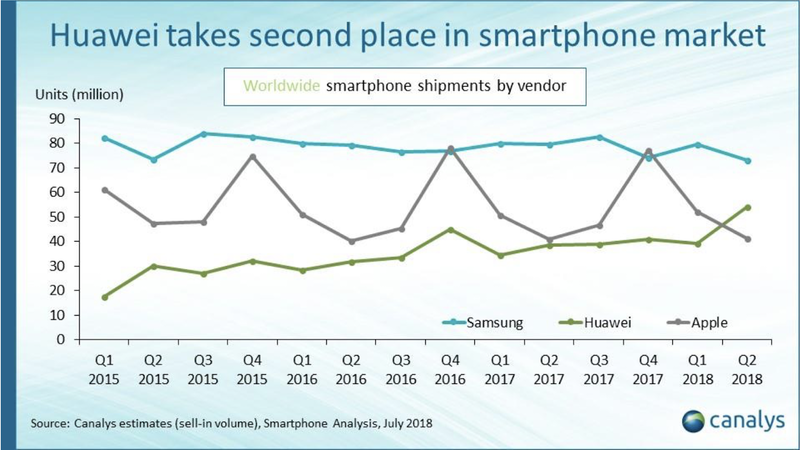 The overall market has shrunk by 1.8% in Q2 2018.But the surprise is that Huawei now has a 15.8% market share with 54.2 million smartphones shipped in Q2. It doesn’t mean that Apple is performing poorly. The company is shipping more smartphones this year compared to last. Apple suffers from seasonability compared to its competitors. Samsung and Huawei sell many different devices and release new phones all year long. Apple usually releases new devices in September. Chinese smartphone manufacturer Huawei is now the second biggest smartphone manufacturer in the world according to new reports from IDC and Canalys, as The Verge initially spotted. In IDC’s latest report, the firm says that the overall market has shrunk by 1.8 percent in Q2 2018. But the biggest surprise is that Huawei now has a 15.8 percent market share with 54.2 million smartphones shipped in Q2. It doesn’t mean that Apple is performing poorly. The company is shipping slightly more smartphones this year compared to last year. Apple also has a slightly bigger market share with 12.1 percent of the market. 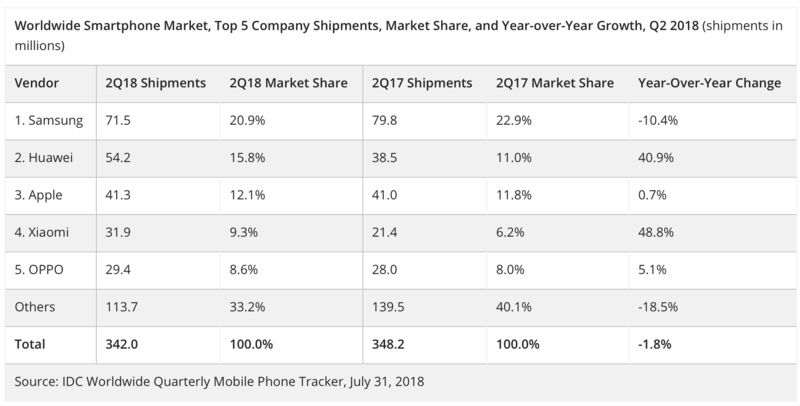 Samsung is shipping 10.4 percent less smartphones but still remains the leader with 20.9 percent market share, or 71.5 million smartphones. In other words, many Samsung buyers are now buying Huawei devices, or other Android devices. 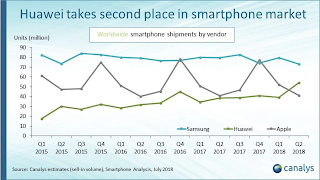 Canalys confirms this trend with the same order — Samsung, Huawei and then Apple. But the firm also highlights that Apple suffers from seasonability compared to its competitors. Samsung and Huawei sell many different devices and release new phones all year long. Apple usually releases new devices in September, which creates a huge spike during the last quarter of the year. Apple will likely overtake Huawei and maybe even Samsung in a couple of quarters. It’s interesting to see that Huawei is performing so well while the company has had issues with the U.S. government. If you browse the smartphone category on Amazon, Honor devices usually appear near the top of the list — Honor is Huawei’s brand for cheaper devices. The Huawei P20 Pro is also a solid device for those looking for a premium device.